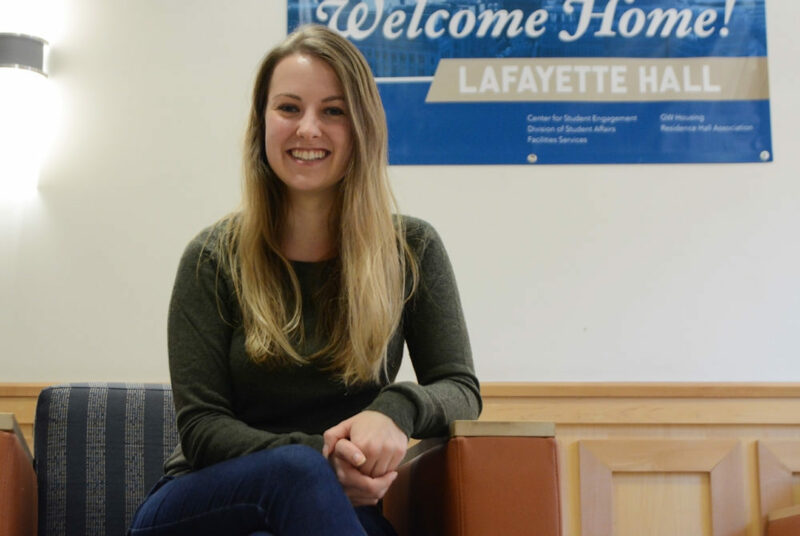 Rachel Metz, the Residence Hall Association president, said Lafayette Hall has provided freshmen with strong communities in the past. The hall will house freshman again starting in the fall. Lafayette Hall will once again house freshmen next academic year – two years after it was transitioned to a residence hall for upperclassmen. About 75 freshmen, or 3 percent of the incoming class, will live in Lafayette beginning this fall, according to GW Housing’s website. Officials and student leaders in housing said the move will make sure there is enough space to house the Class of 2021 on campus. Freshmen will make up about 60 percent of Lafayette’s 126 residents next academic year, according to the GW Housing website. Sophomores and juniors will live in the rest of the hall. University spokeswoman Maralee Csellar said officials occasionally change what residence halls house which classes to make sure students have places to live. Last year, officials began mandating that students live on campus through their junior year. “Part of Lafayette Hall is returning to be a first-year building in order to meet the needs of the incoming class,” she said. Part of Lafayette Hall is returning to be a first-year building in order to meet the needs of the incoming class. GW admitted a record number of students this spring but is still expecting a class of about 2,500 to 2,600 students, about the same number of first-year students the University has enrolled in the last few years. Csellar declined to say if the number of students admitted this year influenced the change. Lafayette Hall housed freshmen for at least 15 years until fall 2015, when it transitioned to only second and third-year housing and Mitchell Hall became a predominantly freshmen residence hall. The switch aimed to house about 200 freshmen in Mitchell Hall, instead of dividing up first-year students between Lafayette and Mitchell halls. Rachel Metz, the president of the Residence Hall Association, said housing assignments are adjusted to accommodate the number and type of students who require on-campus housing each year. This varies based on the size of the freshman class, how many students are studying abroad, the number of transfer students and renovations, she said. “On-campus housing assignments are generally designated to ensure that living arrangements are made with individual class populations’ desires in mind,” she said in an email. But the shift back to freshman housing will not affect the way RHA works with Lafayette Hall, Metz said. Lafayette Hall has previously housed freshmen classes who enjoyed the building and used its location and amenities to build a strong community. Lafayette Hall is not the only residence hall to mix students from different classes. Mitchell, West and Merriweather halls all house freshmen and upperclassmen, which has not impacted students’ experiences in those residence halls, Metz said. “These experiences further strengthen the community within Lafayette by fostering a climate of learning from and mentoring each other,” Metz said. Mac Bassett, the current RHA programming chair for Lafayette Hall, said the move could impact the kind of students who want to live in Lafayette Hall. Most students chose Lafayette Hall because it is quieter than other residence halls, but this could change when the hall houses “louder” freshmen, he said. Lafayette Hall also does not include kitchens within each room, unlike most of the other residence halls that house upperclassmen. There is one community kitchen in the basement. “Since next year I’m going to be a junior, I personally would not want to be living in a building with freshmen,” he said.